The Islamic Republic's government has ruled out negotiations with Washington over its military capabilities, particularly its missile program, which is run by the Revolutionary Guards. 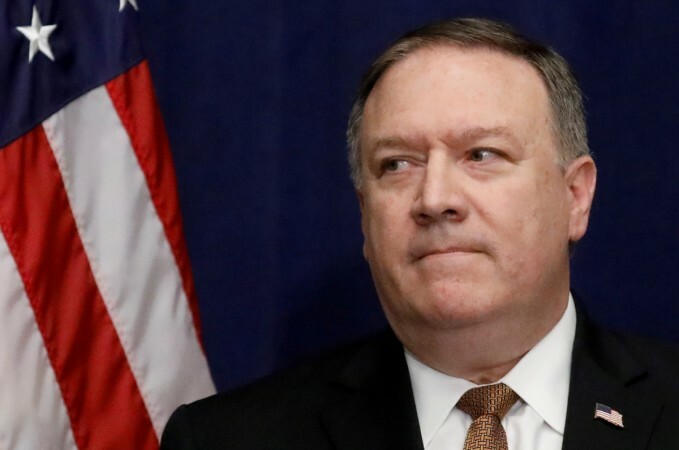 US Secretary of State Mike Pompeo on Saturday condemned what he described as Iran's testing of a medium-range ballistic missile capable of carrying multiple warheads as a violation of the international agreement on Tehran's nuclear program. Amid tension between Washington and Tehran over ballistic missiles, Pompeo warned in a statement released on Twitter that Iran is increasing its "testing and proliferation" of missiles and called on the Islamic Republic to "cease these activities." President Donald Trump pulled out of an international nuclear agreement in May and reimposed sanctions on Tehran, criticizing the deal for not including curbs on Iran's development of ballistic missiles or its support for proxies in Syria, Yemen, Lebanon and Iraq. Pompeo's statement provided few details about the latest Iranian missile test. "The Iranian regime has just test-fired a medium-range ballistic missile that's capable of carrying multiple warheads," he wrote in the tweet. "This test violates UNSCR 2231," he added, citing the United Nations Security Council's endorsement of the international nuclear agreement. "We condemn this act." US Defense Secretary Jim Mattis, addressing a security forum in California, said the Iranian launch was significant and was a reminder that Tehran was unlikely to be deterred from pursuing missile technology or supporting militant proxies. "It shows that our best efforts to try to talk them out of their aggressive support of terrorism is probably going to be as unsuccessful as the U.N's effort to stop them from launching missiles," Mattis said. "And it could grow beyond that if it's not dealt with," Mattis said. On Tuesday, the head of the Atomic Energy Organization of Iran warned the European Union that Tehran's patience was running out on the bloc's pledge to keep up oil trading despite US sanctions. He said Iran could resume enriching uranium to 20 per cent purity if it fails to see economic benefits from the 2015 deal that curbed its nuclear program.